There’s more than one way to skin a cat … er … build a tea plantation. The common theme through much of what we saw today was exactly that: how to make tea plants. Traditionally, humans have allowed plants to go to seed, and then planted those seeds. That involves a male plant and a female plant, and the mixing of DNA, which can have unpredictable results. For many crop plants, farmers came to realize that taking cuttings meant the new plant was identical to the parent plant. If you have a perfect cultivar, don’t pollute the DNA with random Mendelian fluctuations; keep the strain pure. This process, whether it entails planting cuttings or grafting varietals onto different rootstock, is known as cloning. Today at the World Tea Expo, clonals and interesting varietals of tea plants turned into a bit of a theme for the day. I’ve been looking for a good green Assam for quite a while. The overwhelming majority of the world’s green tea comes from Camellia sinensis var sinensis: the Chinese varietal of the tea plant. Camellia sinensis var assamica, the Indian varietal, is quite different. We wandered over to Tealet’s booth and found that they were in the middle of a video recording. We met up with TJ Williamson, who said that they did, indeed have green Assam (both smoked and unsmoked), but we’d have to wait until they finished the video thing. After we chatted for a bit, he said that he’d like to interview Doug and I for the World Tea Podcast. We spent the next hour sipping tea and talking into TJ’s microphone. 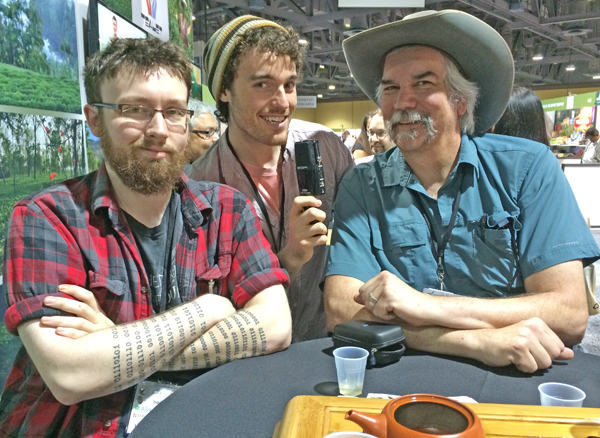 Totally not a posed picture of me (on the right), TJ (middle), and my son, Doug (left) recording the World Tea Podcast. The smoked green Assam was unique. The first hit on the tongue was very astringent, and very different from the aroma. It had a full mouthfeel, and it mellowed to a light smoky malty flavor that was very pleasant. They steeped the first infusion with 188-190 degree (F) water, and the second infusion with 175 degree water was much less astringent and much smoother. Much of our afternoon consisted of placing orders and tasting tea — two of my favorite things to do. We found a lot of different cultivars (many of them clonals), and ordered some great new tea for the tea bar. One particularly significant stop was at Ajiri Tea. I know I have said a few unflattering things about a particular Kenyan tea company, but I’d like to note for the record that I’ve never had a problem with Kenyan tea. Ajiri in particular is doing some wonderful things. When Kenya gained independence from Great Britain in 1963, many of the huge tea conglomerates retained their land and operations. Many tracts of land, however, were broken up into family farms and cooperatives, which now represent almost 60% of Kenya’s huge tea industry. That’s who we prefer to buy from. Ajiri was founded not just to export tea, but to create jobs (the word “ajiri” is Swahili for “employ”), especially for women. The boxes for their tea are hand-made, as are the beaded string ties for the bags. All of the labeling and decoration on the outside of the boxes is handmade from dried banana tree bark, and profits go back to Kenya for educating orphans. This is a tea operation we can get behind. Look for their products on our shelves next month. Me, with Kate Holby of Ajiri Tea. You can see some of their tea box designs in the upper left. I want a shirt in the pattern of Kate’s dress! Some of the handmade tea boxes from Ajiri. Every one is different. Posted on 31 May 2014, in Tea Biz and tagged Ajiri Tea, bacon tea, Camellia sinensis, clonal tea, Geoffrey Norman, green Assam, Kate Holby, Kenya, Kenyan tea, Lazy Literatus, smoked green Assam, Tealet, TJ Williamson, World Tea Podcast. Bookmark the permalink. Leave a comment.